The Staff & Contract Carriage Buses from Tata Motors provide ultimate comfort for commuters traveling to office or back home. Various features have been incorporated to enhance the aesthetic appeal and safety of travel. Staff & Contract Carriage Buses from Tata Motors are also chosen by corporates as the most preferred mode of transport for their employees. These fully built buses offer best-in-class operating economy and have better resale value. The Staff & Contract Carriage Bus is available in a wide range of choices from 16 seaters to 51 seaters and variety of floor-height options. 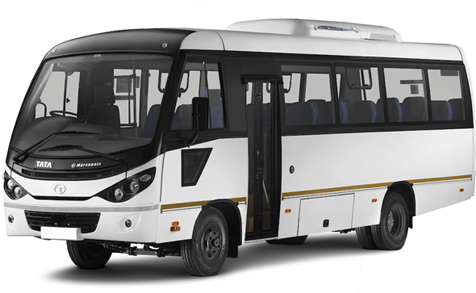 The buses are available in BS IV specifications with both Diesel and CNG fuel options. Chassis for Staff buses are available in both Diesel & CNG options, overall length varying right from 6m to 12m. Available in BS IV specifications.